If you’re working on a data acquisition project requiring extended data collection, Grant Squirrel series data loggers allow users to increase their internal memories if necessary. Grant and its North American distributor CAS DataLoggers show you how it’s done in this brief Technical Article. You can also watch Grant’s YouTube video at: https://www.youtube.com/watch?v=ObdN-rmM68E. Note: This requires version 3.5 of SquirrelView software and version 4.5 firmware (Controller and Acquisition) in the Data Logger. You can find these versions on our Download page. 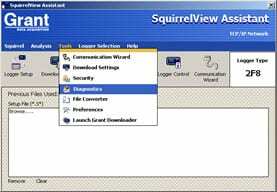 With the Squirrel data logger connected to a PC, launch the SquirrelView software and open the Diagnostic window by going to Tools and Diagnostics. See the image below. Then click on Format and the logger memory will be reformatted to the selected size. Note: This depends on the size of memory card installed in the data logger–older SQ20xx models could have as small as 16MB.